More than coffee… It’s perfection in an instant! 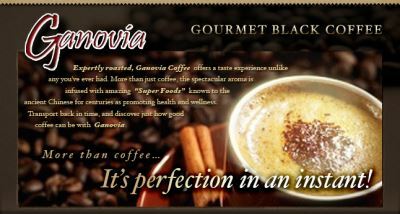 Expertly roasted, Ganovia Coffee offers a taste experience unlike any you've ever had. More than just coffee, the spectacular aroma is infused with amazing "Super Foods" known to the ancient Chinese for centuries as promoting health and wellness. Transport back in time, and discover just how good coffee can be with Ganovia. Our deluxe Arabica Black features a robust blend of full-bodied flavor boasting a bold intensity that is richly smooth. This coffee is perfect for the mature palate seeking a dark and intense blend as smooth as silk. Our signature blend features a delightful aroma of full-flavored enjoyment showcasing a light yet velvety smooth finish. It’s subtly bold with the essence of cocoa for instant perfection in every cup.